The U.S. Commerce Department isn't backing down on Canada. 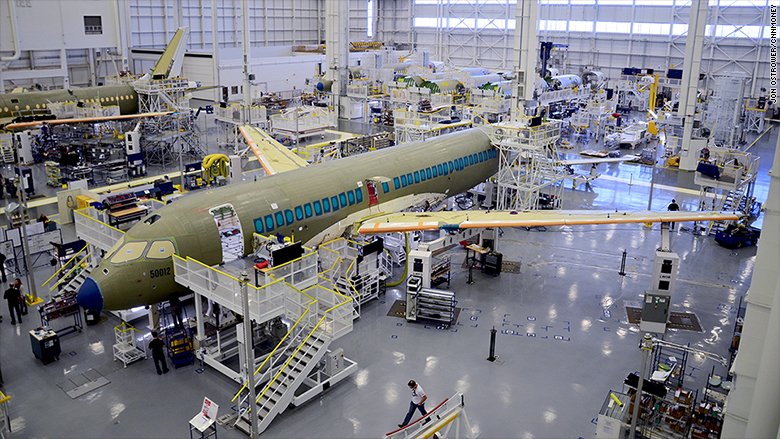 The department on Wednesday upheld its earlier tariff decisions against Canadian plane maker Bombardier, ratcheting up an already contentious trade spat between the United States and Canada and the U.K. 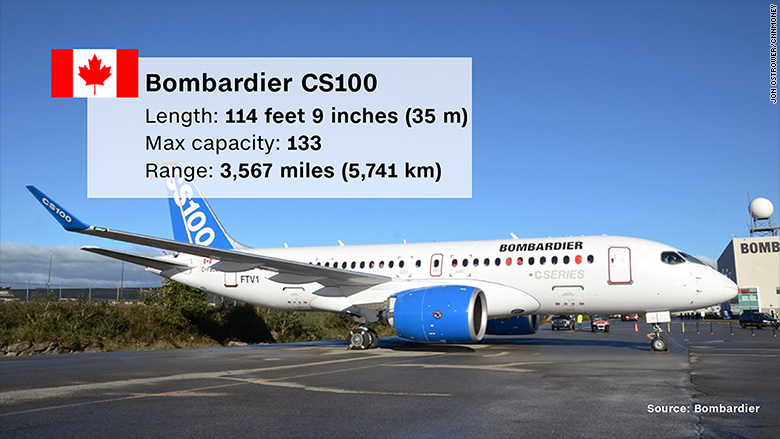 In October, Commerce issued preliminary findings that called for levying a pair of tariffs totaling nearly 300% on imports of single-aisle Bombardier C Series airliners. Boeing, the American aerospace giant, claims it was harmed by the new Bombardier plane, alleging Bombardier unfairly benefited from bailout subsidies from the Canadian federal and provincial governments. Boeing claims those funds allowed Bombardier to sell its new C Series airliner to Delta Air Lines (DAL) at "absurdly low prices" in violation of U.S. trade rules. Delta in 2016 ordered up to 125 110-seat C Series jets for its fleet. Deliveries were expected to begin in spring 2018, but those plans are in question pending the outcome of the case. The tariffs are not final unless the International Trade Commission also determines that Boeing was harmed by the alleged subsidies and price dumping by Bombardier. The ITC is expected to rule early next year. "Unfortunately, the Commerce Department decision is divorced from [industry] reality and ignores long- standing business practices in the aerospace industry, including launch pricing and the financing of multibillion dollar aircraft programs," said Mike Nadolski, Bombardier's Vice President Communications and Public Affairs. "Moreover, we are deeply disappointed that the Commerce Department did not take this opportunity to rectify its past errors." Boeing hailed the decision as a victory and said the decision affirmed that "Bombardier has been subsidized by government funds." "Boeing is seeking a level playing field in the aerospace market and adherence to the globally-accepted agreements governing free and fair trade," said the company in a statement. "We look forward to the conclusion of this matter when the International Trade Commission makes a final decision in early 2018." If the ITC determines that Boeing wasn't harmed "the investigations will be terminated and no orders will be issued," according to the Commerce Department. On Monday, the ITC held a day-long hearing in Washington, D.C. as part of its investigation. Chrystia Freeland, Canada's Minister of Foreign Affairs, said in a statement that the tariffs "are highly punitive to aerospace workers on both sides of the border." "The Government of Canada is deeply troubled by the protectionist nature of Boeing's allegations, which seek to advance its market dominance by excluding Bombardier's C Series aircraft from the U.S. market. It is beyond all reason that Boeing could be threatened with injury in a market segment it exited over a decade ago." Boeing stopped building its roughly 100-seat 717 airliner in 2006, which Delta classifies in an equivalent size class as the C Series it has purchased. The ongoing case has already disrupted deals between Boeing and Canada. The Canadian government last week decided to purchase used F/A-18 Hornet fighters from Australia rather than buy 18 new Boeing Super Hornets. Canadian Prime Minister Justin Trudeau had threatened to nix the proposed $5.23 billion deal with Boeing as long as the trade case continued. The spat has pushed Bombardier and Boeing's European rival Airbus close together. The pair agreed in October to form a partnership giving Airbus a 50.01% stake in the jetliner program and announced plans to build C Series jets on a second assembly line in Mobile, Alabama. Bombardier and Airbus claim jets assembled in the U.S. would not be subject to any tariffs, but Boeing disagrees saying the tariffs would should similarly apply to "partially assembled" planes manufactured in U.S. factories. Delta's Chief Executive said the airline has no intention of paying the 300% tariff on its new jetliners. The tariffs would increase the price of each jet for Delta or any U.S. airline by almost four times, effectively rendering them not economically viable. U.K. officials have warned that the tariffs could threaten 4,100 jobs at plants in Northern Ireland making parts for Bombardier. The Commerce Department pointed out Wednesday that Bombardier, the Canadian Government and Boeing "agreed that the proposed transaction between Bombardier and Airbus does not impact these investigations." That deal isn't expected to be finalized until the second half of 2018.